I am excited and my stomach is filled with butterflies as I watch my ajebutters eat this soup and love every single bite. In fact, I am full, but I want to go for seconds, just so I can savor the very delicate taste. In my mother’s kitchen, she used freshly cut beef and okporoko (stock fish). Sometimes, she would add kpomo(cow skin) to the pot. 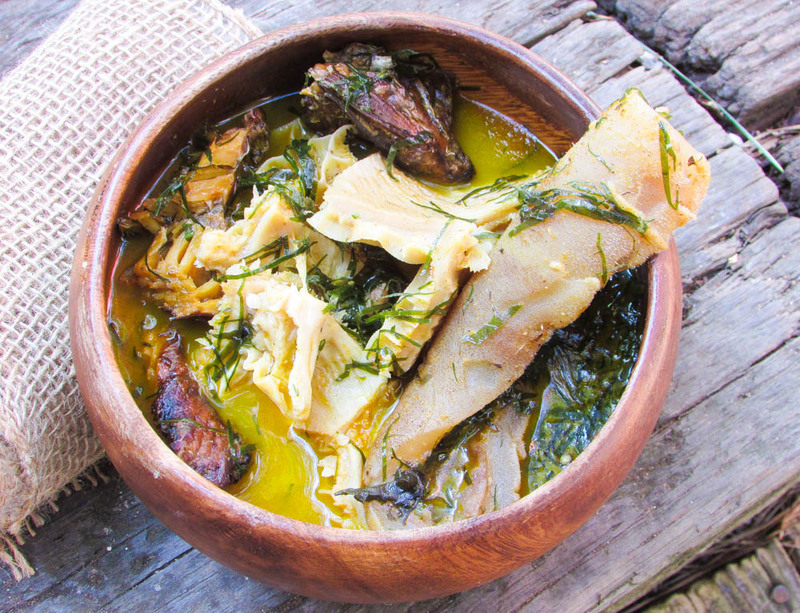 Ofe Okazi is one of those soups that seems so easy to prepare, but also very easy to mess up. The oil must be just enough to give it some color and please no dry Okazi biko! except you can revive it with some cold water. You want to use bright green Okazi leaves. Back to my mother’s kitchen. Whenever she prepared this soup, she had me pound the achi seeds. But my favorite part was in the eating. I loved the beef, the soft and fresh beef she used. I remember biting into the one piece of meat in my soup bowl and I still relish in how soft the beef tasted in my mouth. I swear my mother is a good cook! 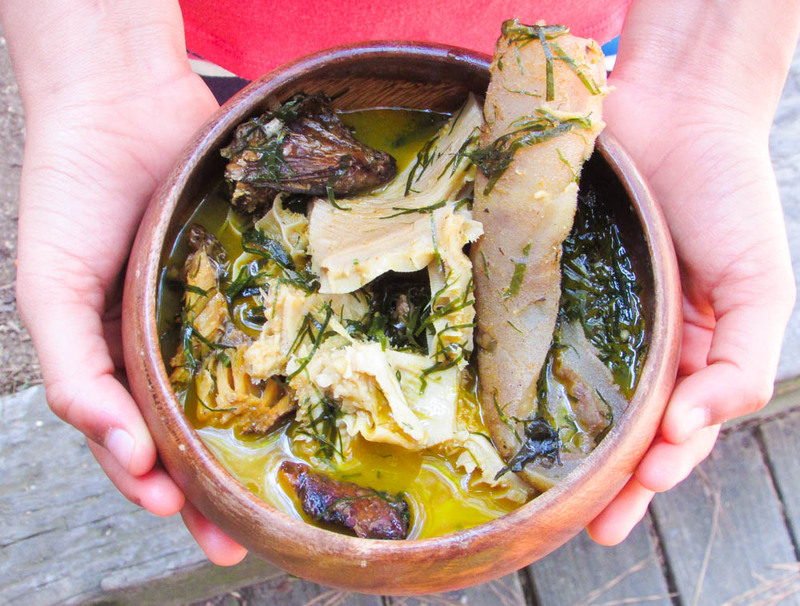 You could taste the soup in the meat…ewo! Now I understand when Nigerians describe their food as fresh. Nawa! In my early 20’s I had this boyfriend who spent so much time with me and loved my cooking. He requested Ofe Okazi once and said to me “Nna mekwa ya ka ya ro’aro.” Meaning, “Nne please make the soup thick for me.” These days, I prefer a light tasting Okazi soup. In my opinion, when the soup is too thick, it loses it’s essence. For your pot, you could use, Achi or Ofor to help thicken the soup. Ofor tastes better, but Achi is also great thickener. I promise any woman trying this recipe, that not only will you lock down that nwoke Igbo that has had his eyes on you, you would also win his folks over…To the guys, you just have to learn how to make this for those days you need to say sorry. Those days when your football club has a major game and you need to keep her mouth busy…I’m giving you the secret now oh. I promise you, she will melt in your arms…oya cook! wash and place the meats into a soup pot. Season with the dry pepper powder, bouillon(if using), salt, and 1tbsp crayfish powder. Pour water a little above the level of the meats and cook until soft. This entry was posted in Bitter leaf soup, gluten free nigerian recipes, Gluten free recipes, Local dishes, Nigerian local soups, Soups, Southeast recipes, Uncategorized and tagged Achi soup recipe, ofe achi recipe, ofe okazi recipe, ofe ukazi recipe, Okazi soup recipe, south eastern recipe, ukazi soup recipe. ← Local Yam Pottage Stew. When Local Hits The Spot!!! !